My sister, in town for business, called and left a message with words I love to hear: "I need to go shopping." This is so much fun as she rarely shops, but when she does, salesclerks everywhere are high-fiving. Because she needed shoes and can no longer wear heels (tragic! 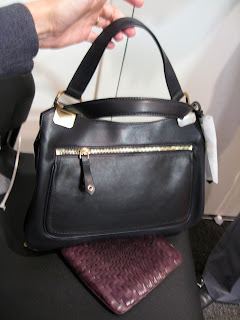 ), we visited the Cole Haan sale yesterday at Soiffer Haskin. She left with 4 pairs, all Nike Air fortified, and a gorgeous orange bag. Damage was under $550. 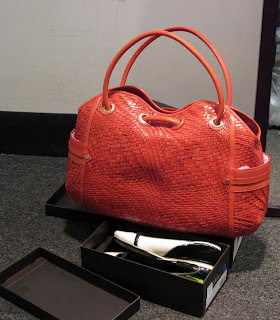 If you buy 3 bags or shoes, you get 20% off the highest priced item. Today I returned to check on restock (they may restock again before the last day), and saw some sandals and bags further reduced. Try to avoid lunch hour because the sale will be packed. Reductions go up to 75% off. Orange bag, because she goes to LA a lot and it's big enough to act like a briefcase. I also forced her out of her brown & black conservative shoebox with the white slings you can see there under the bag. This classic black bag was an almost, but she prefers either a very small bag, or a huge a** briefcase substitute. 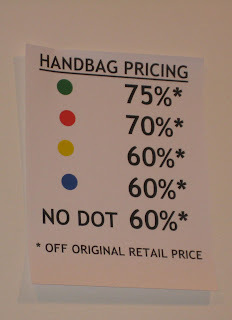 Bag price list. Shoes go down to 50% off. This thong was $39 on Rue La La today, at Soiffer Haskin it's $19. Print it up and take to 34th Street store for 25% off full-priced purchases through Wednesday. You know I'd use it for some jeans, but my sister did also get a beautiful pair of black pants. I love the Banana pant fit. 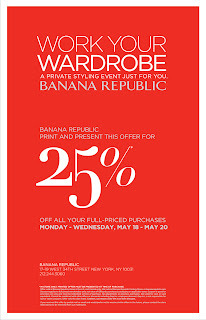 Banana Republic, 17 W. 34th Street btwn 5th & 6th Aves. 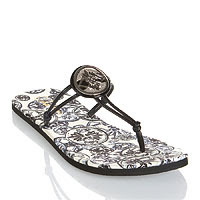 Ooh thanks for the Cole Haan sale update, I so need new, nice yet comfy shoes! Have fun with the sis! What a good sister you are! Le sigh! I LOVE that orange bag. Another fan of that gorgeous orange bag, right here. Love the orange bag. Glad she passed on the black. That's one of those cases of classic turning the corner and getting into drab territory. I love shopping with people who love to shop. By the way, got the lashes! Thank you so so much! Will blog about them as soon as I put them on and wear them out. Oh wow.... this sounds amazing. The Nike Air combined with CH has to be uber-comfy, we are dying to try them! Just to be boring and keep repeating myself, we had a *fabulous* time with you! Can't wait to do it again!